Fiberglass Hawaii is proud to carry a complete line of Posca Pens for custom surfboard and sailboard graphics. 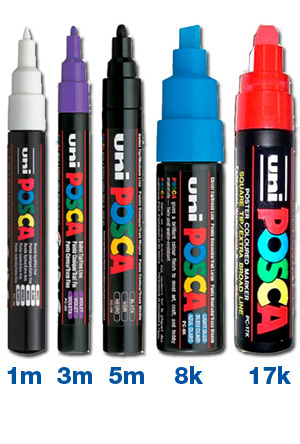 Posca Pens are top quality artists’ markers suitable for use on surfboard foam, canvas, paper, fabric, wood, plaster, masonry, and most non-slick, non-oily surfaces. Posca Pens are used as fine art colors as well as for fabric coloring, decorative work, fiberglass sculpture coloring, interior/exterior faux finishes, set finishing, surfboard painting and handcraft painting. IMPORTANT NOTE:Due to variations in computer displays, colors are for reference only, and are not accurate representations of true product hue.